My Side of the Mountain is a 1959 book by Jean Craighead George. It is set in the Catskill Mountains near Delhi, New York. 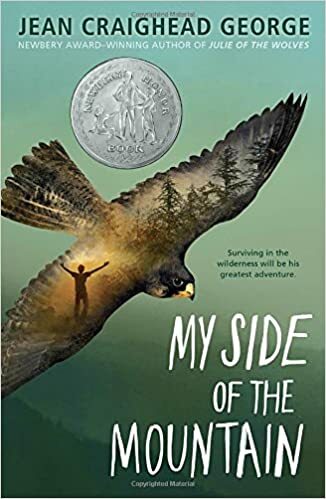 My Side of the Mountain tells the fictional account of how Sam Gribley survives in the wilderness of upstate New York. Sam runs away from his home in New York City in the month of May. He leaves with only a penknife, a ball of cord, an ax, $40 which he had saved selling magazine subscriptions, and a flint and steel set which he had purchased at a store in the city. On his first night, Sam gets on a truck north of New York in search of his family's abandoned and overgrown farm in the Catskill Mountains. He hitchhikes to the Catskills, and spends a lonely first night in his small hemlock lean-to. He catches five fish, but cannot start a fire to cook them. In the morning he climbed a hill and found a small cottage near his camp, the residence of an old man named Bill. Bill showed Sam how to cook his fish and make a fire. Sam then established a house inside an old hollow hemlock tree. As the summer passed his skills and knowledge of the mountains and of survival grew. He learned to live off the land by hunting small game and gathering a wide variety of edible plants and nuts. He made clothes, bedding, and other useful things from deer hide and rabbit fur. He lived off of the wilderness completely. Sam lived a free life in the wilderness for more than a year with a lost school teacher he called Bando. Sam called him Bando because he thought the teacher was a runaway criminal when they first met. Bando and sam spend the summer together. Bando then leaves, promising to return at Christmas. During the winter, his father found him. His father leaves after a while. Sam begins to start making guest house and wonders the whole time if that is realy a good idea. That was the reason he moved away in the first place. He then hears his father, and then his mother, and as it turned out his father has come back with all the rest of his family. The family immediately starts building a house. This page was last modified on 14 January 2018, at 21:40.